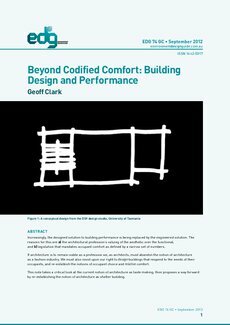 Increasingly, the designed solution to building performance is being replaced by the engineered solution. The reasons for this are a) the architectural profession’s valuing of the aesthetic over the functional, and b) legislation that mandates occupant comfort as defined by a narrow set of numbers. If architecture is to remain viable as a profession we, as architects, must abandon the notion of architecture as a fashion industry. We must also insist upon our right to design buildings that respond to the needs of their occupants, and re-establish the notions of occupant choice and relative comfort. This note takes a critical look at the current notion of architecture as taste making, then proposes a way forward by re-establishing the notion of architecture as shelter building.